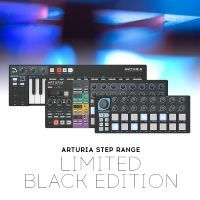 Arturia are reissuing the "Black Edition" versions of their range of MIDI and CV sequencing controllers. 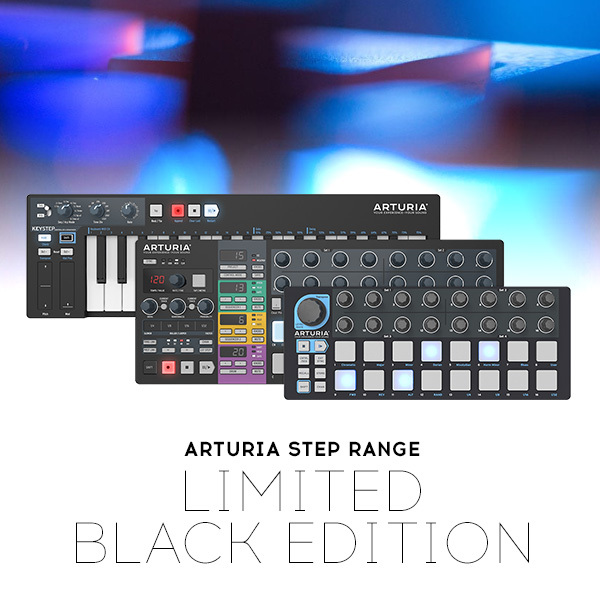 Arturia's trio of DAW controlling, step-sequencing hybrids are now available again in a sleek black finish. Offering something for every musician, the Step range synchronizes the analog and digital worlds, letting musicians control hardware instruments, outboard modules, virtual instruments, and recording software simultaneously. This small format keyboard sequencer features a 32-note slim-key keybed with aftertouch, and lets you sync with & control any software or hardware instrument through its comprehensive connectivity, including USB, MIDI in & out, CV gate, and Sync in & out. Create evolving, polyphonic sequences up to 64 steps long, with real-time recording and rewriting. Bonus: 2 CV / Gate cables, PLUS Analog Lab, SEM V, and Ableton Live Lite software worth almost $300. Packing 16 pressure and velocity sensitive pads and 16 rotary knobs into a neat package, BeatStep is an affordable way for musicians to get creative with simple monophonic step-sequences. Able to control outboard synths and virtual instruments alike, BeatStep's versatility also makes it a great DAW controller. Arturia's 3-part step sequencer now has a sleek new look. Featuring two separate melodic sequencers and a dedicated 16-part drum sequencer, BeatStep Pro gives the adventurous musician a powerful palette of tools to create dynamic, exciting tracks without the need for a computer screen. The Black Edition KeyStep, BeatStep, and BeatStep Pro are now shipping worldwide, and will soon be arriving at retailers near you.